Sanjay Lalbhai can trace his family history 17 generations - all the way back to the court of Akbar the Great. The textile business was launched by his great grandfather Lalbhai Dalpatbhai when he started the Saraspur Cotton Mills in 1897. 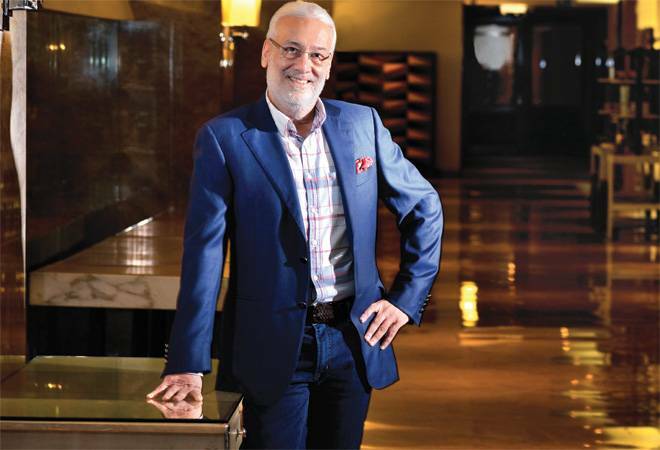 Sanjay Lalbhai got into the business in the 1970s, when the sector was under severe pressure because of the Licence Raj and the rise of the unorganised powerloom sector. He took a decision to first move into denims, which would help him build a global scale business. Then he decided to build brands - Arrow, GAP and others. The group has revenues of about Rs 11,000 crore currently. Now, he is taking the next step with his two sons - Punit and Kulin - by focussing on technical textiles, customised retail solutions and others. In a freewheeling interview with Prosenjit Datta, he talks about how GST has helped his textile business, the philosophy behind the brand strategy, why he did not diversify into newer areas, the future of textiles and the Arvind Group, and finally, what he sees as the role of the promoter of a business vis-a-vis the role of professionals. Edited excerpts. Has the economy settled down? Sanjay Lalbhai: We can see some green shoots. Some businesses have started doing well. Automobiles for one; FMCG also - the HUL numbers are good. Some businesses connected with agriculture are doing well. So are private banks. Some financial sector companies are doing well, not all. I think travel, leisure are doing well. But many manufacturing and export-oriented sectors are still struggling in the aftermath of demonetisation. Has GST settled down as far as your business is concerned? Yes, if you look at textiles, GST has been good for the compliant players. Why couldn't anyone consistently create huge shareholder value or build humongous scale textile companies earlier? After all, roti, kapda and makaan are very basic needs. You have a DLF in real estate but no one could create a DLF in textiles. When I joined the business in 1978, powerlooms created the major mess. All organised players came to grief. There was Licence Raj, so you were not allowed to grow and you could never build scale. Before we could come out of the Licence Raj, the powerlooms took over. They were completely unorganised - no license, no tax, no labour laws - while we were supposed to live in a world where everything was controlled. Then liberalisation came, but the unorganised sector flourished. So if you really see, we had to survive by bringing denim into this country. Had we not looked at a new global product category, which was not restricted to India, we would not have been able to compete with powerlooms. That's why we thought of denim. That saved us. The unorganised sector, till the advent of GST, has had the bigger market share in the entire $80-billion textiles space. So, the organised sector would be 15 per cent, while the unorganised would be 85 per cent. Now this entire thing is going to get rewritten. And once GST is really enforced - GST has been introduced, still not been enforced and all the loopholes have not been plugged - this industry will dramatically change. The second-biggest change is the bankruptcy code. All the small, even large organised players who were evergreening their loans, taking advantage of the subsidies dished out in this industry and really misusing those are getting weeded out. They are all going into insolvency and they will be liquidated. So, the genuine, honest players, for the first time since I've joined this industry, will come into play now. We're quite excited because this is now a level playing field. Are you planning to buy anything under the IBC process? Why should we buy? The government still provides huge incentives to create new assets. Also, the firms under bankruptcy proceedings have old cultures and businesses have been mismanaged and overleveraged. Of course, you'll pay the right price and I am not saying there will be no bidders but we are not interested. I would rather set up an asset light play where you create an eco-system, you create IPRs, you create closeness with the end-consumer, and you become part of their supply chain - H&M, Zara, GAP or Levi's. So, you give them a complete solution up to garment, innovation, design and you do only things which are proprietary or which you don't want to give out to the others. All other parts - spinning, weaving, etc. - are not rocket sciences. How much revenue comes from this part? We are a Rs 11,000-crore group. I think a good Rs 10,000 crore would be textiles plus brand businesses. So, brand is becoming very big - around Rs 4,000 crore and growing at around 25 per cent. In the early '90s, I saw that instead of textiles, the value will lie in creating brands because they are aspirational, there is stickiness. You can create differentiation and scale. But, then people were getting things made by neighbourhood tailors and so we were quite ahead of our time. We were the first to bring Arrow, Lee and Wrangler. The first standalone ready-to-wear foreign brand store was built by Arvind for Arrow. And we didn't visualise Arrow as a mass brand which it was in the US - we saw that it should be a premium, formal shirt and that's how we repositioned Arrow for India. So, ever since 1992, when Arrow was among the first brands to come to this country, we brought in many global brands and are the largest or second-largest platform for international brands in this country. Over the years, we have nurtured few businesses because we happened to get into them as we had to develop capabilities for our textile business. Yes, many of your diversifications came as an off-shoot of your textile business.. Yes, in the early '90s we were doing very well. We thought of gross diversification - from refineries to telecom and many other sectors. We brought in a consulting firm and it said stick to the core. C.K. Prahlad said stick to the core. But I dabbled in many things at that time. We had already started diversifying - we got into telecom. We have a very small business in telecom. Our engineering business, Anup Engineers, was started by my father. The water business was started because we built our zero-discharge facility when we set up our Santej Complex, one of the largest shirting complex, in 1997. We got into real estate business because we had a land bank and we thought we need to monetise it and we created the capability. Has the real estate business started doing well after demonetisation and GST? Also, you are building those large-scale industrial parks in your real estate business..
That's what we started because we had those large land banks. But we built houses in Bangalore for executives. We built mid-priced, executive high-end housing. It is a small business but growing very well. Be it real estate, be it water, we have got the basics right. Then sometime ago, I had seen that technical textiles would play a very important role in India. So, it started. Then Punit (Lalbhai, Executive Director, Arvind Limited and elder son of Sanjay Lalbhai) came back and he started giving it the kind of focus it needed. I had started taking Arvind from B (business) to C (consumer) - Arvind as a brand rather than Arvind as a fabric which I am selling B2B, to H&M and other brands. Then, Kulin (Lalbhai, Executive Director, Arvind Limited and younger son of Sanjay Lalbhai) came back and said I'm interested in the B2C business and built the Arvind Store. We were very clear about the journey. It was from tailoring to ready-to-wear and from there to brands. And from brands it is going to be customisation. That is where we are headed. So after brands, the new territory to be won would be using big data and predictive analysis to know exactly what you want and giving you a mass customised solution, which is unique and tailored to what you are. That is all being nurtured by Kulin. How is the technical textiles business shaping up? Technical textile is a very interesting space - it is based on the growth of the Indian economy. Protective clothing, for example, will now become mandatory if you're working in a steel plant or a refinery. You will have to wear protective clothing for fire and other hazards you will face. In defence, you will have to wear bullet proof. All these things will become mandatory. Now that the Indian economy is developing, specialised textiles will be required for all sorts of applications, from industrial end-use to medical, to roads, to new materials like composites which are going to be used for aerospace or automobiles to low cost, non-corrosive housing, etc. It is growing very rapidly. We will again build it as an IPR-led business, with a lot of collaborations, a lot of unique materials, through a lot of R&D, a lot of patented processes, products and services. You had evaluated refineries but did not get into it because of the advice of your consultant. I had selected telecom and thought of refinery, too, at that time but they advised against it. But you had already started telecom so you were stuck with it. Yes, we were bidding with French Telecom for all the circles. So yes, we evaluated everything... paper, steel. In retrospect, does it seem like the right decision, given the kind of troubles in telecom? Well, some people made it big in telecom just as they did with refineries. My thought process was that we needed to be in businesses where it was possible to build size and scale. We were becoming the biggest in denims but it was still a fragmented sector and politically you have so many tariffs and barriers in textile as an industry across the world. I was arguing with our consultant that if I want to achieve scale, I have to get into businesses where you have multibillion dollar companies and there's already a roadmap. The question was - would you succeed? You require government patronage, approvals and phenomenal execution skills and, of course, resources. Arvind was equally capable of raising resources. When I had done my first roadshow and the first GDR, we had raised multibillion dollars at that time and it was unprecedented for textiles, so we could have easily raised capital. It was not beyond us to get into these areas, but I don't know whether it was the correct decision or wrong. You didn't think of getting out of textiles even during the worst days when powerlooms were killing the industry? Because denim did so well there was no question of getting out. We had solved the problem. The question was - should we have diversified and how do we get into scale businesses. Now you can. You can be a $20-billion brand company, a $10-billion water business, a $5-billion advanced materials (technical textiles) business rather than a $2-3-billion textile company. You built many brands but own a few. Several are licensed brands that you have nurtured like Arrow or GAP. Is there a danger that they might want to come in on their own? Some are perpetual licences and some are very long-term licences, so they cannot be terminated. By that time, if it has become a multibillion dollar valuation business and then if the owner of the brand wants to buy me out, he is most welcome. We are creating shareholder value and, who knows, I could become so large that I may want to buy a global brand. Now the world has changed so dramatically since you last considered diversification, are you tempted to look at new businesses again? I am diversified. I am not talking about clothing or something conventional. Technical textile is a new-age solutions business. It is about creating intellectual property rights and solutions - it is not about building more conventional factories, assets, etc. It is at the cutting-edge of solving problems or inventing new things. So your focus now is on technology? That's what I am saying. As a promoter, my time is better spent in inventing things rather than managing because my businesses are run pretty well and the professional managers are better managers than me by a long shot. So, why do I need to do that? But this (inventing and seeding new business) is not their brief. After all, who will take that risk when there is a 100 per cent chance of failure because it has never been done before. So, when I say that I want to use indigo on every consumable medium in the world from marble to nylon to leather to wood, it's never been done before and someone has to make a statement. When I am saying this, about indigo for example, even I am not sure whether it can be done. It is just a thought. It is not backed yet by reality. I personally think everything starts when the thought comes. You have to think and you have to have the courage to think without inhibitions.